Abu Dhabi (Agenzia Fides) - "The Pope's presence in Asia, especially in the Middle East, for the great inter-religious meeting in Abu Dhabi, represents a ray of hope: he leaves us a sign and a message so that we can live in peace and harmony not only in the United Arab Emirates, but in all the countries of Asia, like India": this is what Indian Archbishop Machado, at the head of the community in Vasai and President of the Office for Ecumenism and Interreligious Affairs of the Federation of Asian Bishops' Conferences (FABC), reports to Agenzia Fides, among those present in the United Arab Emirates. "The repercussions of this conference will reach all Asian countries where there is cultural and religious pluralism", the Archbishop told Fides. And he notes: "Sometimes it is not easy to live the message of fraternity and solidarity in societies characterized by pluralism. The Pope courageously shows the leaders of the world that this is possible". According to Mgr. Machado, "Pope Francis does not only promote a mission of inter-religious dialogue, but continues the universal mission of the Church, to give a Gospel message to all peoples". "On our behalf, we are called to leave our comfort zones - he continues - and follow the example of Pope Francis in promoting peace and harmony in our respective nations and in the world". Following the example of the Pope, he observed "it is up to us Christians to take the initiative and take the first step, showing openness and benevolence towards people of other religions". 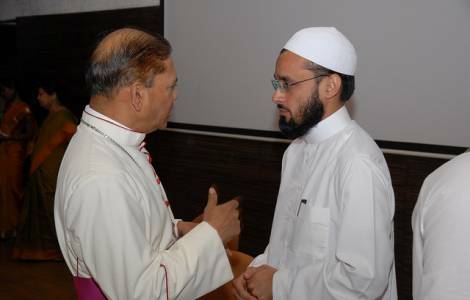 AFRICA/TANZANIA - Bishop Kilaini: "From the Emirates a message of peace and harmony that will help Africa"
ASIA/INDIA - Archbishop of Goa: "The Indian Constitution is in danger"